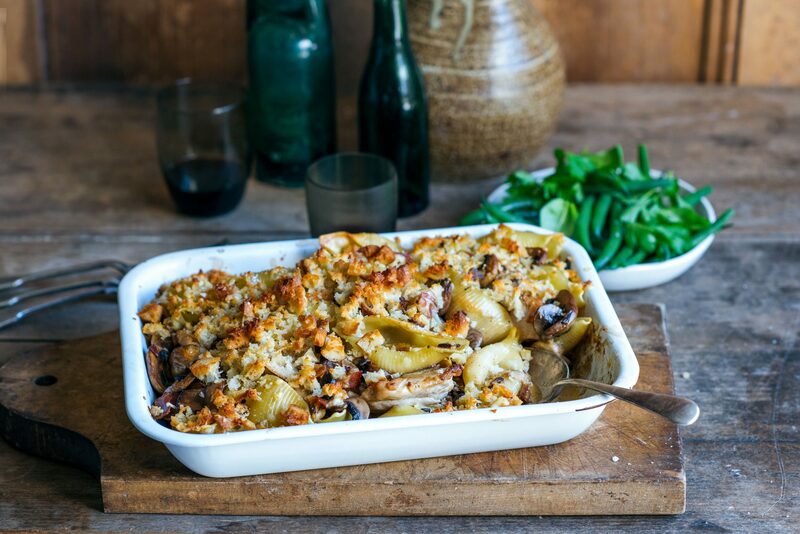 Goooood morning – today’s recipe is a perfect weekend comfort-food dish, it’s easy to make and can be prepared in the morning then just bunged in the oven in the evening, so ideal for entertaining friends. 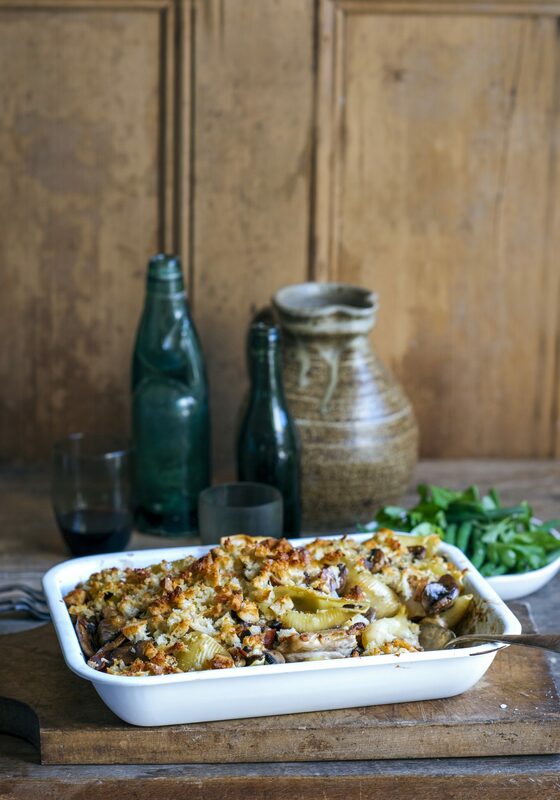 Basically you have a rich earthy mushroom flavour enhanced by the inclusion of reconstituted dried porcini mushrooms, pungent garlic, salty pancetta, and tender chicken all smothered in a white wine and cream sauce, nestled up with baked pasta shells and topped with a crunchy parmesan, sourdough ‘crumb’. All the good stuff right there. It will happily feed up to 8 people, and all you need on the side is some lightly blanched green beans tossed with soft herbs and butter or a simple rocket salad. Put the porcini mushrooms in a bowl and cover with 1 cup of boiling water. Bring a large pot of water to boil and cook the pasta for 2 minutes less than the recommended time on the packet. Drain well. Heat the oil in a large heavy based pot then cook the pancetta for 3-4 minutes until golden and crispy. Remove from the pan and set aside in a large bowl. Add the chicken to the pan, and cook in batches for 4 minutes each side or until cooked through, then remove from the pan and add to the pancetta. Melt the butter in the same pan and cook the mushrooms, in two lots, (add the first lot to the chicken and pancetta) for 5-6 minutes until cooked through. Drain the porcini mushrooms reserving the soaking liquid. Chop the rehydrated mushrooms and add to the pot then add all of the cooked ingredients: the garlic, wine and cream and season to taste with salt and pepper. Cook a further 5 minutes together. Preheat the oven to 180˚C. Put a layer of pasta into a deep 24cm x 32cm baking dish. Spoon over half of the chicken and mushroom mixture, stir around to combine then repeat with remaining pasta and mixture. Sprinkle with ¼ cup of grated parmesan. Put the remaining parmesan in a food processor with the sourdough and pulse to make large chunky breadcrumbs. Sprinkle over pasta and bake for 30-35 minutes until golden and heated through. Serve with herby green beans. Bring a large pot of water to boil. While it is heating roughly chop the herbs. Drop the beans into the boiling water for 3-5 minutes until cooked but still slightly crunchy. Drain well, toss through butter and herbs and serve seasoned with salt and pepper.